After a shaky start to the season, the Raiders took off like a comet. The team's newfound trajectory looked like it could take us all the way to the AFC West title. Now, two games later, the comet has crashed to earth. And unless we can win four out of the next five games, our divisional title hopes will likely be dashed, because it looks nine wins will be the minimum to contend. Meanwhile, three wins over the next five games are necessary to reach the .500 mark. I would suppose that Tom Cable's tenure hangs in the balance of that eight-win mark. But who really knows? The offense is the obvious culprit for our recent woes. But buried in the smoking rubble is that our defense has allowed 902 offensive yards over the past two games. We have allowed 180+ net yards rushing in each of the past two games. On the other side of the ball, how does Darren McFadden get just two yards on eight carries? I don't know which is more absurd: the .25 yards rushing average, or the fact that he only got eight carries. His stats weren't much better the previous week. I doubt that McFadden's abilities suddenly evaporated. Other teams aren't respecting our passing game, and our offensive line doesn't seem stout enough to do anything about it. Hence, the running game has been shut down. According to Cable, "This isn't anything new for us. You're going to see eight- and nine-man boxes. That's what happens when you're a good running team. Our system has been built to handle that." Alas, "systems" don't play the games. It seems to me that we have nagging deficiencies at quarterback, wide receiver and offensive line. Combine that with a defense that seems to be regressing, and we suddenly find ourselves wondering what's up with this team. In other words, are the Raiders still climbing out of the hole—or are they climbing back in? I still expect eight wins this season. Anything less would be unacceptable. I'm sure that Mr. Davis would agree with that. In other words, it's time for a turnaround. What can I say? Our contention for the AFC West title increasingly hangs in the balance with each passing week. It's up to Gradkowski and Company to make something happen, and to put last week's debacle behind us. Go RAIDERS! Here we are, on the cusp of something special. If the Raiders pull this off, if they beat the Steelers on the road at this juncture, it will be epic. It will be a national story. And it will take the narrative of the season to the next level, and to a place we haven't been in ages. Go RAIDERS! Thanks to the NFL Network, I was able to watch the abbreviated broadcast of Sunday's victory. While at the game, I saw Darren McFadden running over the Chiefs, but sometimes from a distance. Only on the television, with the multiple angles and close-up shots, was I truly able to behold the magnificence of his performance. This isn't about statistics. His stats were solid on Sunday, but nothing spectacular. This is about attitude and ferocity, which he suddenly has in spades. Perhaps his most impressive play was one that was overlooked by the broadcasters, and it was a play on which he was the defender. Before the end of the half, Campbell missed on a throw to Higgins, and the ball was intercepted by Jon McGraw, who started ripping off yards in our direction. Then, suddenly, McFadden came flying across the field and literally ran squarely through and over a blocker and blasted McGraw out of bounds. It was a thing of beauty. So to Darren McFadden and all of the other Raiders who were blasting the Chiefs on Sunday with tough, physical play, I send this love letter. Thank you for restoring the toughness to the Silver and Black. Keep up the great work. Well, that was one hell of a Sunday. Inching through gridlock at 9 a.m, eating half-cooked meat in the mud, then filing into the Coliseum amid the revived chant: RAIII-DERRS! RAIII-DERRS. The old Raider Nation mojo was back, big time. That was evident. Would the Raiders respond? Not initially. The rain returned as the Raiders failed to score in the first half. But then the clouds parted ever so slightly, and so did the Chiefs as Jacoby Ford torched them to start the second half. Blast off. You know the rest of the story. Now, Raider Take regulars know that I'm not fond of so-called moral victories. For example, when we laid that egg in Arizona, I didn't want to hear, well, if only Janikowski makes that kick, blah, blah, blah. The fact is he didn't, we sucked, and we didn't win, and if "ifs and buts" were candy and nuts, then every day would be Christmas. But it cuts both ways. I'm not into immoral losses, either (to coin a phrase). Did the Raiders offense look ugly for a lot of the day? Yes. Was some of the playcalling questionable? Sure. Were there too many penalties (not counting the phantom ones called by that miserable crew of zebras)? Yeah. Were too many passes dropped? Absolutely. Should Cable has saved one of those challenges? Of course. Did we make it too close? Certainly. But you know what? We won. Period. Not only that, we won a game that we otherwise always lose. You know, that game--the close contest that always ends in tears, with some asinine prevent scheme, or a missed kick, or ill-timed penalty, or a ball dropped, or a turnover, all amid a hail of whining about the officials. This time, the defense avoided the breakdown, and brought the beatdown. This time, one of our receivers (hello, Mr. Ford) literally ripped a victory out of the hands of the opponent. Once again, McFadden delivered in the end. And Jason Campbell, even while looking like a cure for insomnia at times, just keeps delivering victories. I'll tell you what, it sure was nice to see a true professional running that two-minute offense. He looked totally comfortable and in command of the clock and the situation. I've waited years to see competence in such situations. Thank you, Jason. This ultimately looked and tasted like a cultural shift. It felt like a mature performance. The team has become something, something we haven't seen for ages: a winner. Okay, time to hit the reset button and start talking about Sunday's game against the Chiefs, a classic AFC West clash with divisional title implications. I think that defense is going to be the story of this game. The Chiefs have an explosive running attack, and Asomugha is out, putting added pressure on our secondary. There is therefore the real potential of being menaced by the big run and the long ball. It's going to be a real test, and we're going to have to bring our "A Game" to pass it. I'd like to think that our offense will post a third straight performance of 500+ yards, but that's probably unrealistic. I think that this is going to be more of a brawl than a shootout. As it should be when the Raiders play the Chiefs in Oakland, in November, with rain in the forecast. This is going to be fun. First place, here we come! Well, let me start with Randy Moss. In the words of Nancy Reagan, "Just say no." As in, hell no. Thank you. Yes, I've been agitating for veteran help at wide receiver, but I draw the line with this joker and his poisonous act. Anyhow, Halloween festivities got in the way of my usual postgame timeline, and I really won't be able to say much more than has already been said by those who kept the lights on for me. In the past, I've said that our defense resembled Cirque du Soleil: clowns flying around, hitting nothing. Well, the clown show is apparently over. It has been replaced by the UFO known as the Good Ship Raider, whose Men in Black are flying around, hitting everything. I look at Jason Campbell, and I can't say I'm blown away. And yet he's obviously doing something right. It's strange. He still makes me yawn, but he has presided over the biggest two-game offensive Raiders explosion since the AFL merger, if I'm not mistaken. That would be two consecutive performances of more than 500 yards. Yes, a lot of those yards have come from the run game, but the dude has the stats to prove that he's been a big part of it. And then there's DHB. In a game where Zach Miller wasn't a big factor, and with Murphy out, DHB stepped it up and delivered his best game yet. And how abut Marcel Reese? Crikey. Honestly, I think most NFL observers are happy to see the Raiders doing well. That's what I'm hearing on the radio and elsewhere. Yes, they all enjoyed kicking us while we were down, but we were down for so long that it had to become boring. The emergence of a strong Raiders franchise is newsworthy, particularly when it's accompanied by meltdowns in Denver and San Diego. But the Chargers still concern me, as they've shown that they can overcome slow starts in the recent years. But for the first time in a long time, the Raiders are ready to play a game that really matters, a game that could ultimately decide our divisional destiny. Three weeks ago, we were mourning The Debacle Across The Bay. Now, more than 1,000 offensive yards and 92 points later, we are barreling down the road to first place in the AFC West. Losing this game wouldn't be lethal, but it would be a big setback. But winning it would be huge. It's high time for the Raiders to do something huge, and I expect that they will. 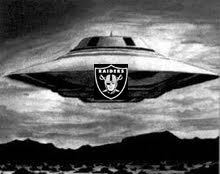 Here come THE RAIDERS! P.S. Even the national media are taking notice. Heck, Peter King over at Sports Irritating ranks us 13th in the league as of this morning. It will be interesting to keep an eye on the NFL spread for the upcoming Chiefs game. Right now, Vegas has the Chiefs on top, but I expect the Raiders to prove that the house doesn't always win.